All the Pictures of the Month/Quarter from 1997-2006 in one handy place. 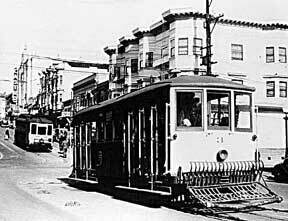 Market Street cable car 133 sits on Castro Street on 08-May-1941, waiting to be towed to the scrapper. Wayne Miller Collection. All rights reserved. December, 2006 Picture of the Month. 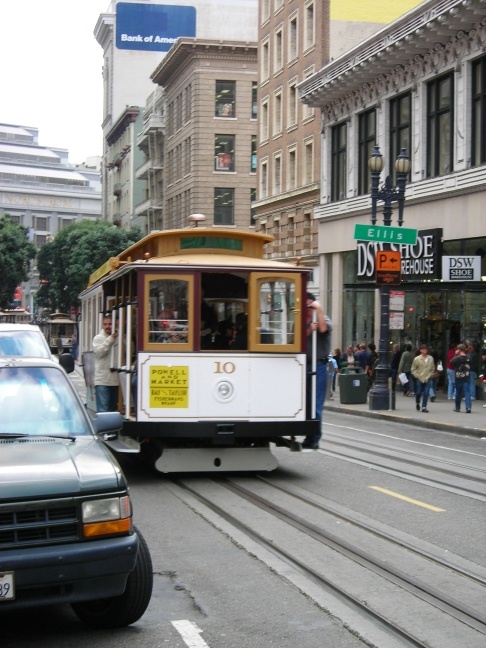 Car 10 rolls up Powell Street in October, 2006. Photo by Joe Thompson. November, 2006 Picture of the Month. A special tenth anniversary dash sign created by Val Lupiz. November, 2006 Picture of the Month. Tony's Cable Car neon sign. 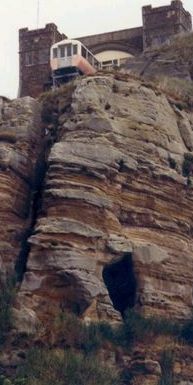 August 2006. September, 2006 Picture of the Month. 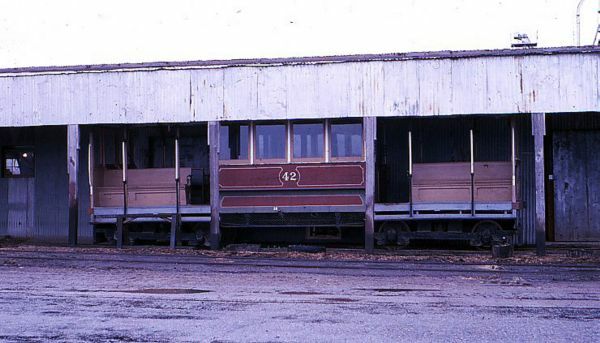 Car 24 was the only piece of California Street rolling stock to survive the earthquake and fire. (Source: San Francisco Public Library, San Francisco Historical Photograph Collection, AAC-7890). August, 2006 Picture of the Month. 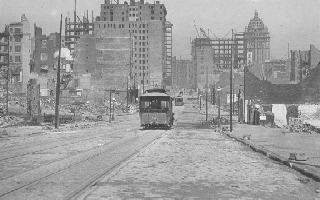 Geary Street cars run amid the ruins near Union Square in December, 1906. (Source: [group 5:40], Roy D. Graves Pictorial Collection, ca. 1850-ca. 1968, BANC PIC 1905.17500--ALB, The Bancroft Library, University of California, Berkeley). June, 2006 Picture of the Month. 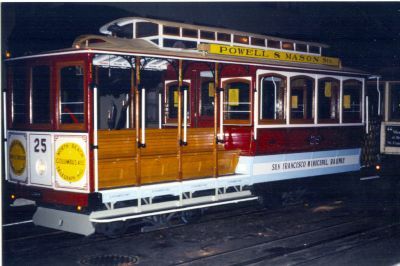 Powell-Mason cable car No. 509 is halfway around Market Street turntable. It will soon depart for another trip to Bay and Taylor Streets. With its white front, green sides and a Byllessby Market Street Railway shield the year is most likely 1938. In August 1995, No. 509, now numbered 9, would be retired from service and replaced in April 2000 with a brand new No. 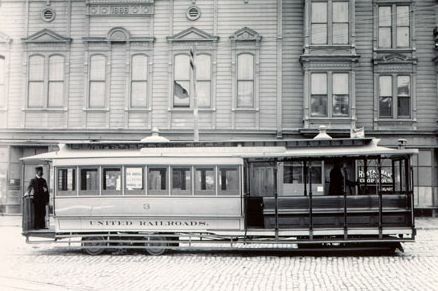 9, which like the car depicted is in the Market Street Railway white front paint scheme. Like its predecessor the new No. 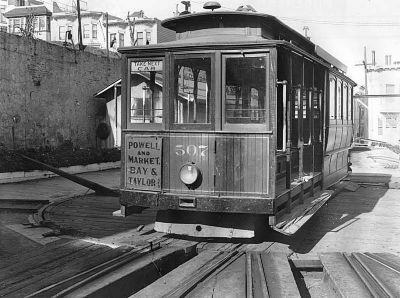 9 proudly boasts a Market Street Railway Byllessby shield in honor of the former operator of the Powell cable cars lines, 1921-1944. Walter Rice collection. May, 2006 Picture of the Month. 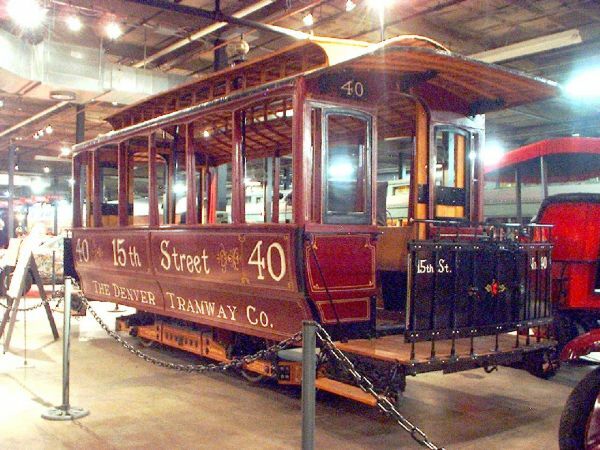 Denver Tramway car 40, preserved at the Forney Transportation Museum. Photo courtesy of the Forney Transportation Museum. All rights reserved. March, 2006 Picture of the Month. 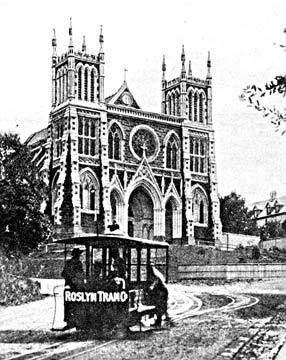 A Roslyn cable tram near the pull curve next to Saint Joseph's Cathedral. February, 2006 Picture of the Month. 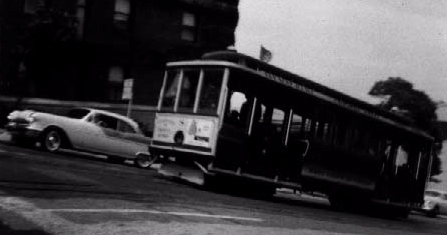 Car 507 represents the look of Powell Street cable cars during the period that the "Song of the Powell Street Grip" was composed. Cars bore dark green colors with tongue-in-groove fronts. Richard Schlaich collection. January, 2007 Picture fo the Month. 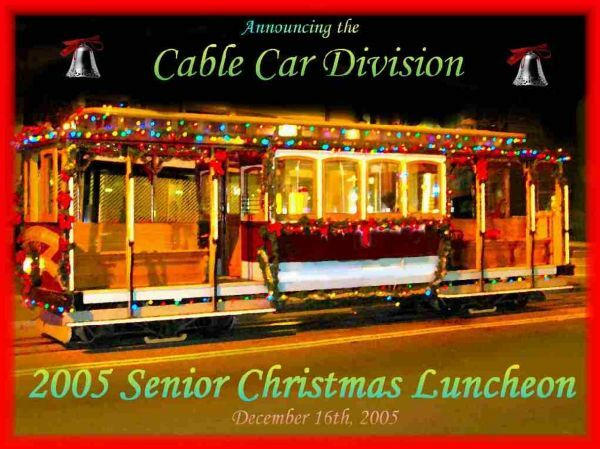 Val Lupiz designed this invitation, with a photo of decorated car 60, for the Cable Car Division's 2005 luncheon for Senior Citizens. Photo and artwork by Val Lupiz. All rights reserved. December, 2005 Picture of the Month. 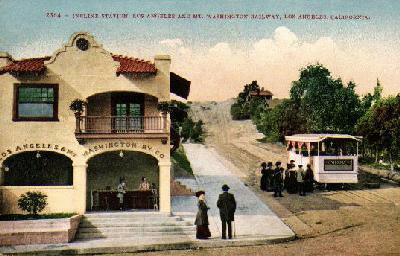 A Valencia Street cable car at 28th Street and Valencia on 29-May-1904. 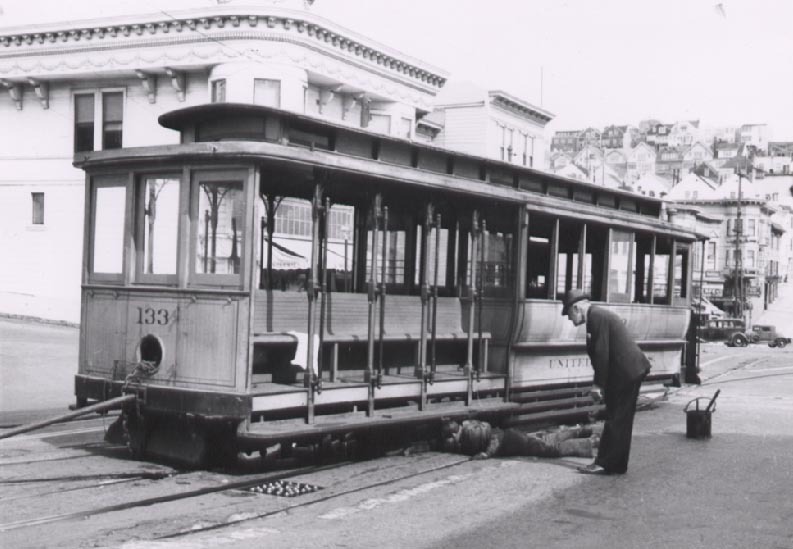 (Source: San Francisco Municipal Railway United Railroads Collection Photo #175). November, 2005 Picture of the Month. 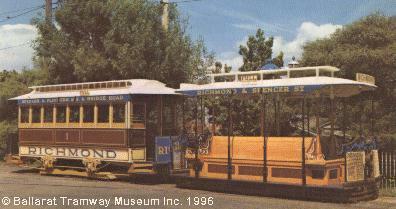 Roslyn cable tram 95. Photo by Peter Erlich. All rights reserved. September, 2005 Picture of the Month. Car 25 displays its round dash signs. Car 25 had signs of this style from the late 1970s until 1982. Car One still has them. Walter Rice photo. All rights reserved. August, 2005 Picture of the Month. 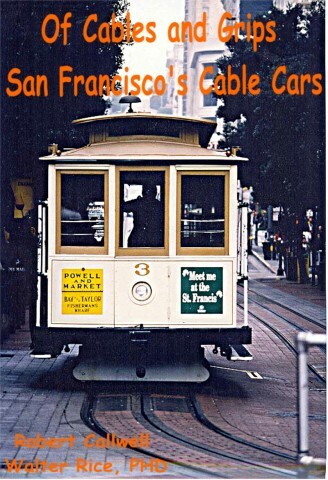 Former California Street Cable Railroad�s O�Farrell, Jones and Hyde car No. 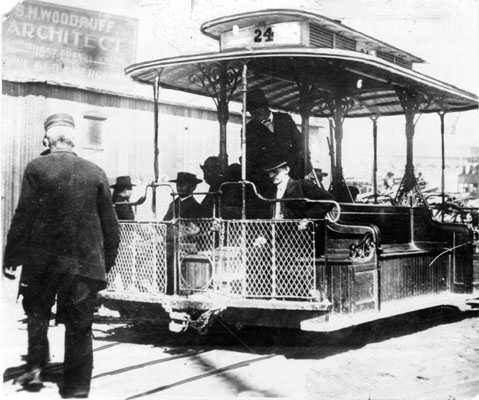 42, built by the W. L. Holman Co. in 1906-07, became surplus when Muni abandoned that line in 1954. Unlike other cars likewise made surplus, which met more orthodox fates, No. 42 found itself in an agricultural setting, a cattle feedlot at Betteravia in the Santa Maria Valley, on the central California coast. The feedlot had its own 3�' gauge railway! 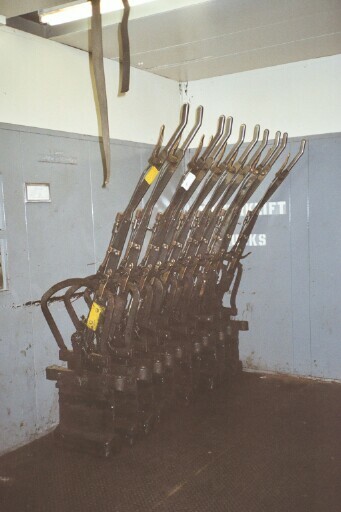 The feedlot operator mounted No. 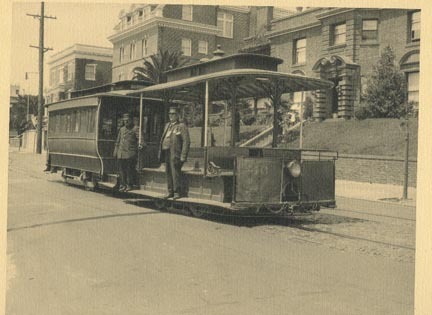 42 on a pair of narrow-gauge Los Angeles Railway Birney streetcar trucks, one of which was motorized, to run the car on the track. The Los Angeles Transit Lines had ended all Birney service on June 30, 1946. No. 42 is pictured at Betteravia during March 1962, 43-years before No. 42 would return to streets of San Francisco. 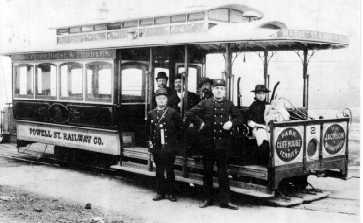 One its Birney trucks would be used by the San Jose Trolley Corporation (Kelley Park) for its Birney car project, San Jose Railroad No. 143. Photo by Jim Walker. All rights reserved. July, 2005 Picture of the Month. 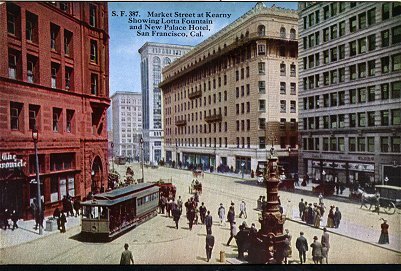 In 1927, Samuel Kahn Market Street Railway president, received a US patent in his name for the white front "safety design." 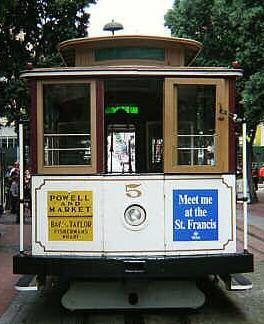 Beginning in 1927 the Market Street Railway�s cable cars had white fronts that featured red window trim. 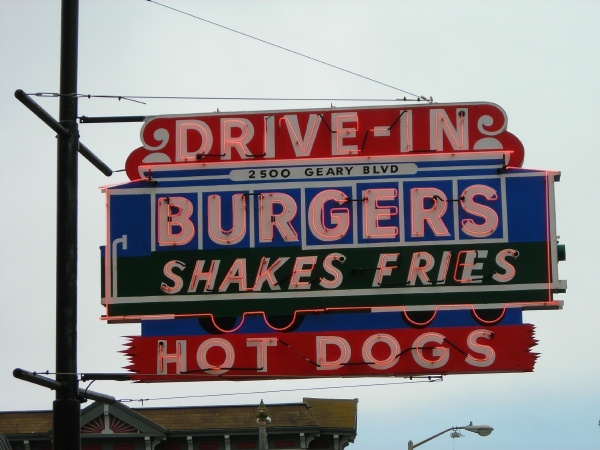 From the late 1930s, until the company�s purchase by the Muni, the Market�s corporate symbol -- the White Front -- was continued, however now minus the red window trim. 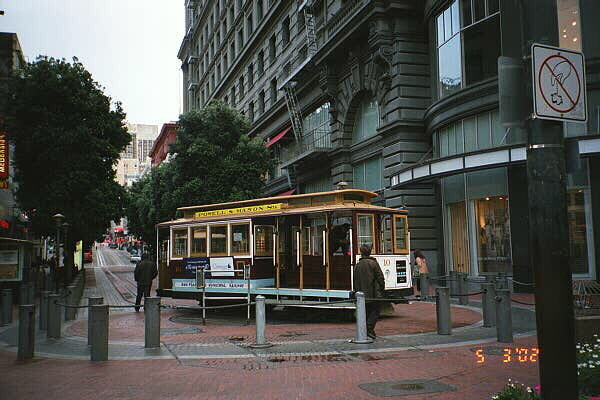 Muni built Powell cable car No. 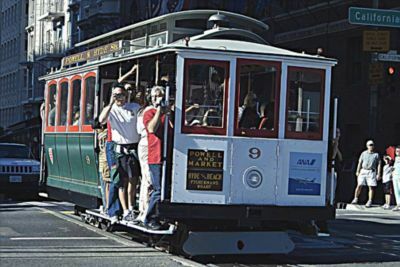 9 that entered revenue service in April 2000 sports a paint scheme honoring the Market Street Railway�s original white front design, as it crosses the California Street cable line, August 2004. Walter Rice photo. May, 2005 Picture of the Month. 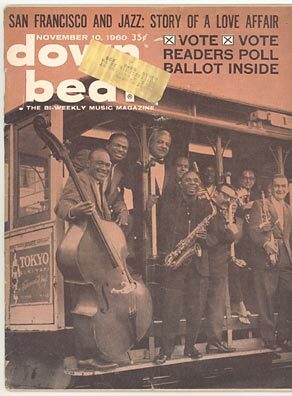 The cover of Downbeat for 10-Nov-1960 featured a collection of jazz musicians posed on a Powell Street cable car. 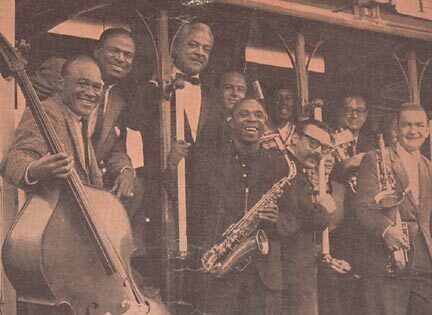 They include Vernon Alley (with the string bass), piansts Earl "Fatha" Hines and Teddy Wilson, Pony Poindexter (holding a saxophone), saxophonist Virgil Gonsalves, pianist Vince Guaraldi (with the glasses and distinctive moustache), singer Bev Kelly, guitarist Wes Montgomery, Brew Moore (also holding a saxophone), clarinetist Paul Desmond, actress and singer Sylvia Syms, and trombonists Kid Ory and Turk Murphy. April, 2005 Picture of the Month. Cover of the second edition. Photo by Walter Rice. All rights reserved. March, 2005 Picture of the Month. 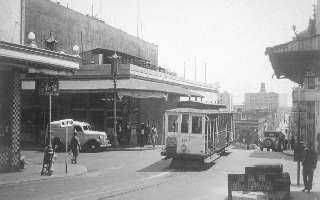 Geary Street steam train with dummy locomotive 2 at Central and Geary, where it connected with Geary Street cable cars. Cemeteries in the background. (Source: San Francisco Public Library, San Francisco Historical Photograph Collection, AAB-7891). February, 2005 Picture of the Month. Clay Street Hill Railroad grip car 8 and trailer 1 (numbered 8 in this photo) on display at the 1893 World's Columbian Exposition in Chicago. (Source: The Book of the Fair). January, 2005 Picture of the Month. The header of the Chinese side of the Rider Alert card. Scan by Joe Thompson. October, 2004 Picture of the Month. 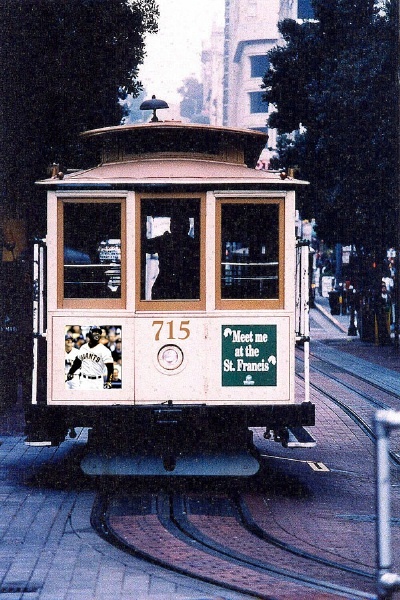 Thanks to Nick Kibre for explaining that the top two characters represent "cable car" as "string cart". I like that. A general view of the Hastings East. 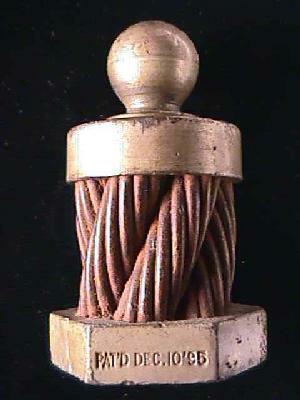 Smaller version. Photo by Grant Dew. September, 2004 Picture of the Month. 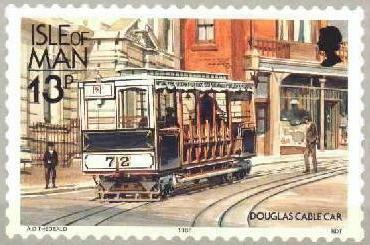 A 1988 stamp depicting Douglas cable tram 72/73. August, 2004 Picture of the Month. 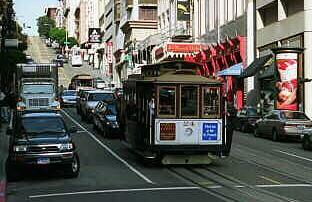 Broadway cable car 2. July, 2004 Picture of the Month. "They�re Back!" 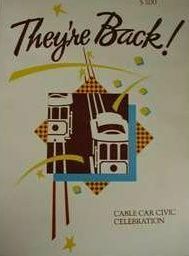 program commemorating the 21-Jun-1984 return of cable cars after the Great Reconstruction of 1982-1984. June, 2004 Picture of the Month. 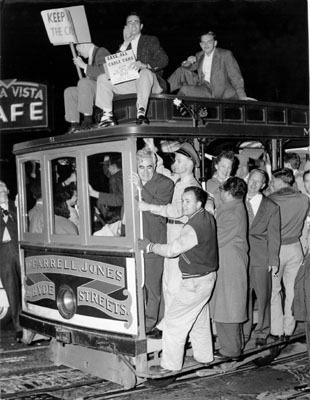 Protestors at Hyde and Beach, objecting to the abandonment of the O'Farrell/Jones/Hyde line on 15-May-1954. Note the Buena Vista Cafe in the background. (Source: San Francisco Public Library, San Francisco Historical Photograph Collection, AAC-8092). May, 2004 Picture of the Month. 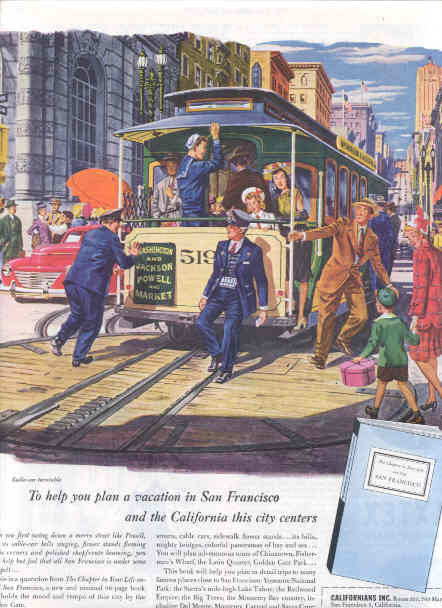 A magazine advertisment for Californians, Inc, an organization that promoted tourism. 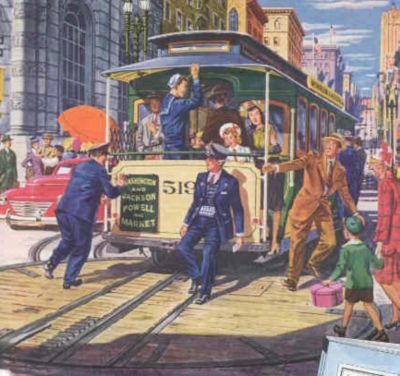 It features car 519 on the turntable at Powell and Market. The ad may be from the late 1940's. Smaller version. April, 2004 Picture of the Month. 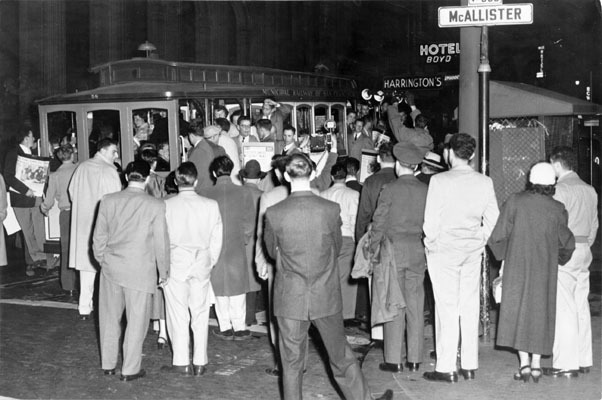 A crowd gathers at Jones and McAllister on the last day of the Jones Street Shuttle, 06-Feb-1954 (Source: San Francisco Public Library, San Francisco Historical Photograph Collection, AAC-8093). February, 2004 Picture of the Month. 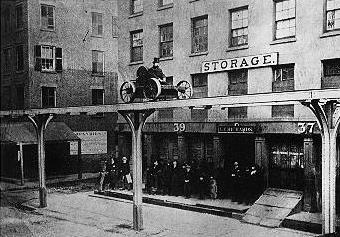 The terminal of the Geary Street Park and Ocean Railway, at Geary and Market, after 1891. Looing west. January, 2004 Picture of the Month. 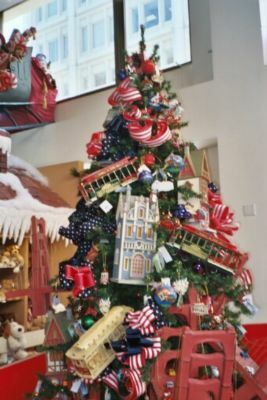 Christmas tree decorated with cable cars, at Macys Holiday Lane, Stockton and O'Farrell. November, 2003. photo by Joe Thompson. December, 2003 Picture of the Month. "�l�vation d'une voiture funiculaire" (View of a funicular car) from the article "Tramway Funiculaire De Belleville" by G De Burgraff, from Le Magasin Pittoresque, 1890. November, 2003 Picture of the Month. 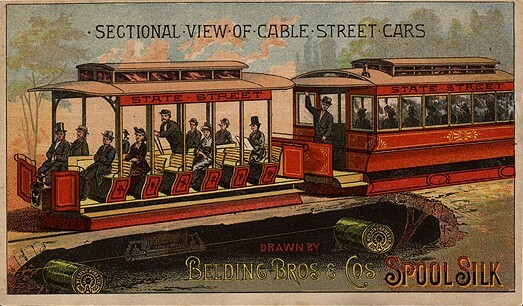 A Belding Brothers silk thread ad depicts a red State Street cable train being pulled by its product. October, 2003 Picture of the Month. 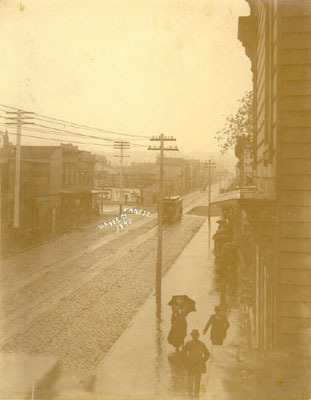 A rainy day at Hayes and Van Ness in 1890. (Source: San Francisco Public Library, San Francisco Historical Photograph Collection, AAB-3966). September, 2003 Picture of the Month. Madison Street and Second Avenue in Seattle. August, 2003 Picture of the Month. 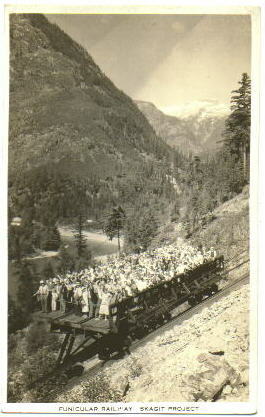 A car of the Skagit Incline carries tourists. Note the tracks on the platform. July, 2003 Picture of the Month. 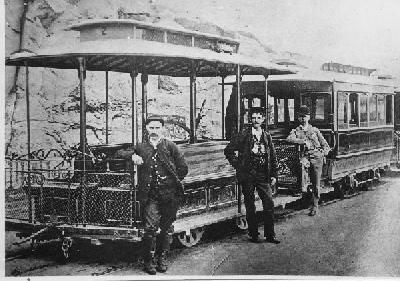 A cable car in Butte. 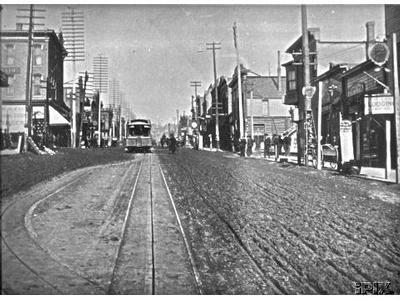 Note the condition of the street. June, 2003 Picture of the Month. 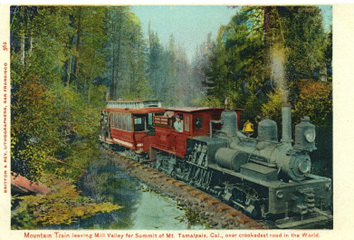 A South Spokane combination car, which ran out to the Cable Railway Addition. Courtesy of Don Galt. May, 2003 Picture of the Month. 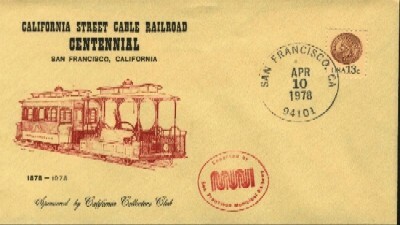 A cachet issued in 1978 for the California Street Cable Railroad centennial. April, 2003 Picture of the Month. 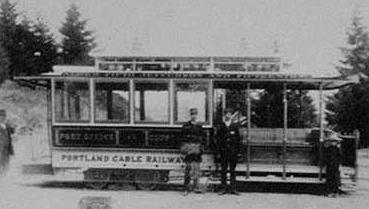 An early view of Tacoma open grip car 6. March, 2003 Picture of the Month. Portland Cable Railway closed car. February, 2003 Picture of the Month. 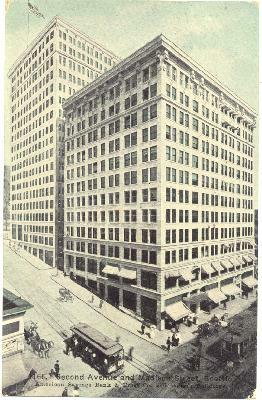 Seattle's American Savings Bank at Second Avenue and Madison Street. January, 2003 Picture of the Month. 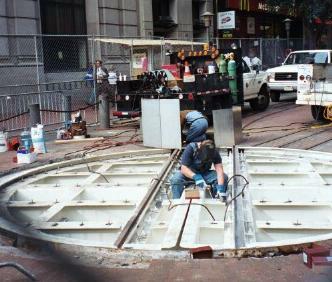 The new Powell/Market turntable just after it was installed. Photo by Joe Thompson, November, 2002. December, 2002 Picture of the Month. 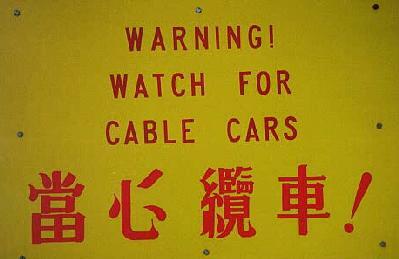 "In the wake of a cable car." 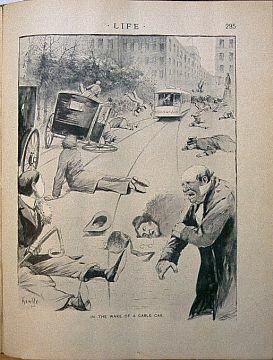 This cartoon, from an 1895 issue of Life, describes the public's fear of operations around the Metropolitan Street Railway's Dead Man's Curve. November, 2002 Picture of the Month. 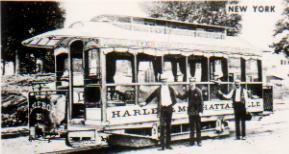 Open parlor car E served the 125th Street and Amsterdam Avenue line in Harlem. Passengers paid a premium fare, $0.25. October, 2002 Picture of the Month. An early cross sectional view of the Brooklyn Bridge deck. 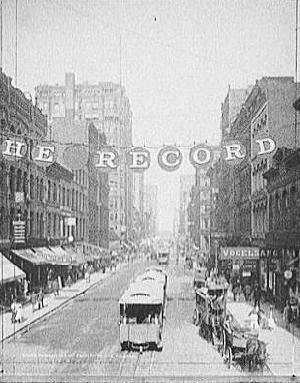 The outer "carriage" lanes later carried trolley tracks (source: "The Brooklyn Bridge", Harper's New Monthly Magazine, Volume 66, Issue 396, May 1883). September, 2002 Picture of the Month. Great Orme Tramway car 5 (Saint Silio) rolls into Victoria Station. Photo by Martin Sch�nherr. All rights reserved. August, 2002 Picture of the Month. 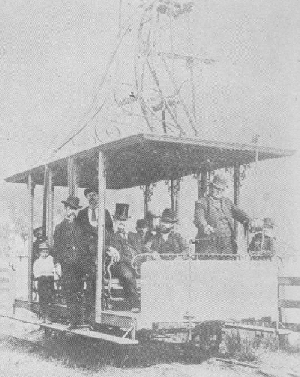 Charles T Harvey making a test run on his West Side and Yonkers Patent Railway in 1867 or 1868. July, 2002 Picture of the Month. Warning sign at the Jackson Street entrance to the Washington/Mason yard. March 2001. Photo by Joe Thompson. June, 2002 Picture of the Month. A 14-May-1955 Powell/Mason transfer issued by the San Francisco Municipal Railway. April, 2002 Picture of the Month. 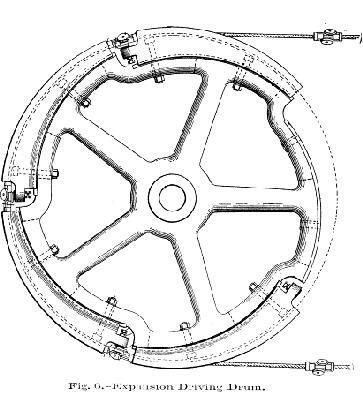 A Rasmussen driving drum with slots for the trucks. 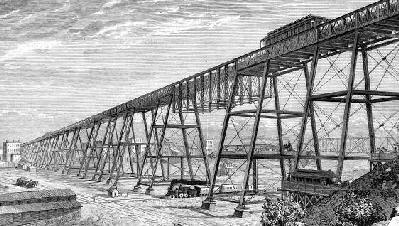 It was intended to be expandable to deal with stretching of the cable (Source: The Heckert System of Cable Railroads" From Manufacturer and Builder / Volume 20, Issue 12, December 1888). March, 2002 Picture of the Month. 524, now numbered 24, at Powell and Post. January, 2002. Photo by Joe Thompson. February, 2002 Picture of the Month. 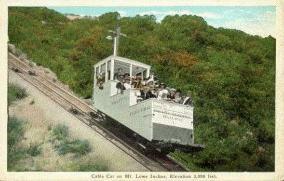 A Hoboken cable car on the viaduct next to the earlier funicular. (Source: Image courtesy of Rail-Road Extra). January, 2002 Picture of the Month. 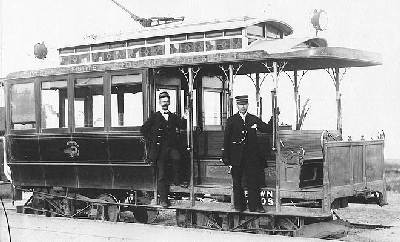 North Sydney cable tram. Smaller version. Photo courtesy of Ric Francis. 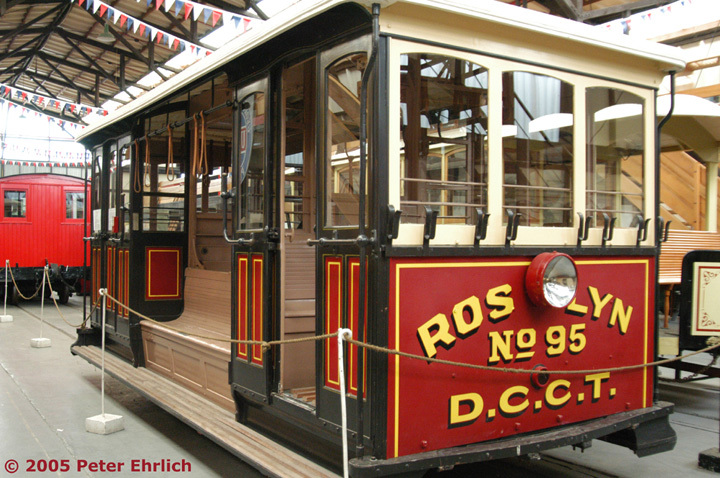 Visit his Western Australian Trams site. December, 2001 Picture of the Month. Car 5 on Powell between Market and Ellis. Powell/Mason dash sign. July 2001. Photo by Joe Thompson. November, 2001 Picture of the Month. Geoff Cryer photographed these recently retired cars from the Glasgow Subway at the Beamish Museum in County Durham in July, 1977. October 2001 Picture of the Month (copyright G A Cryer, 1977). 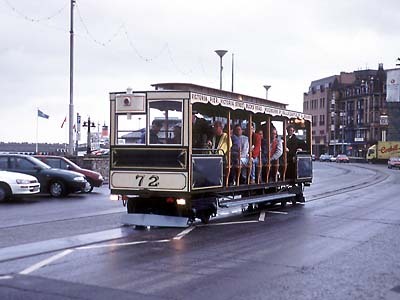 Douglas cable tram 72/73 running on its battery-powered trucks on 20-Aug-1998. Photo courtesy of Geoff Cryer. Visit Geoff's Rail Pages for more excellent pictures. July (Summer), 2001 Picture of the Quarter (copyright G A Cryer, 1998). 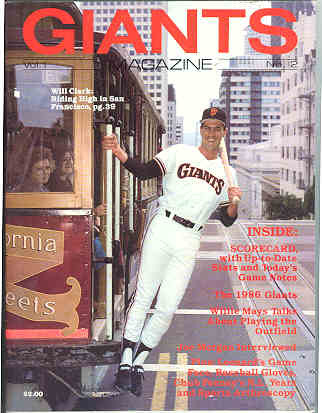 The cover of a 1986 Giants Magazine, featuring rookie first baseman Will Clark riding on a California Street cable car. Clark went on to have a fine career in the majors, retiring after the 2000 season. April (Spring), 2001 Picture of the Quarter. 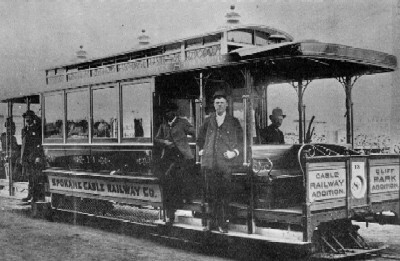 Market Street Cable Railway Hayes Street car 15, photographed by Isaiah West Taber. Smaller version. January (Winter), 2001 Picture of the Quarter. 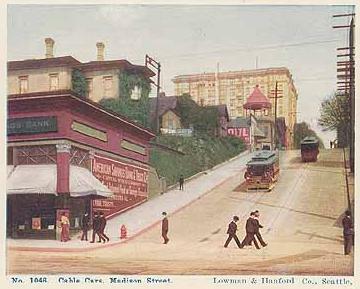 The terminal of the Geary Street Park and Ocean Railway, at Geary and Market, after 1891. October (Fall), 2000 Picture of the Month. Click on the thumbnail to see a larger version. Use your browser's "Back" button to return. September, 2000 Picture of the Month. 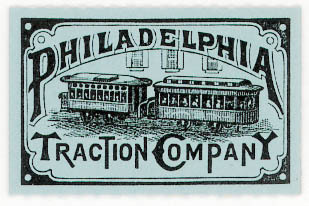 A Philadelphia Traction ticket, showing a cable train hauled by one of its unusual round-fronted, enclosed dummies. August, 2000 Picture of the Month. 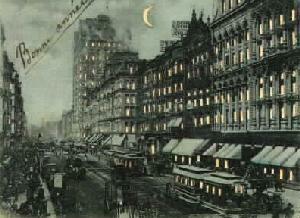 A tinted postcard view of State Street at night, with Chicago City Railway cable trains. July, 2000 Picture of the Month. 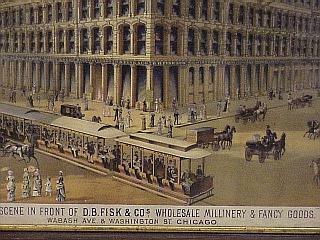 An advertisement for DB Fisk, wholesale, millinery, and fancy goods merchant, located at Wabash and Washington Streets. A Chicago City Railway train with two trailers is visible in the foreground. June, 2000 Picture of the Month. What is it? Remember, the question is not "What is it made of?" The question is "What is it?" May, 2000 Picture of the Month. A menu from the San Francisco Cable Car Room lounge on the California Zephyr, the Western Pacific's vista domed luxury train to San Francisco. 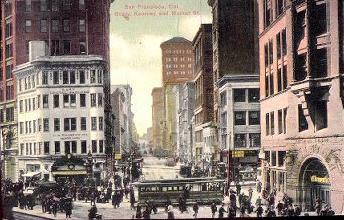 The picture looks down California Street from Mason. 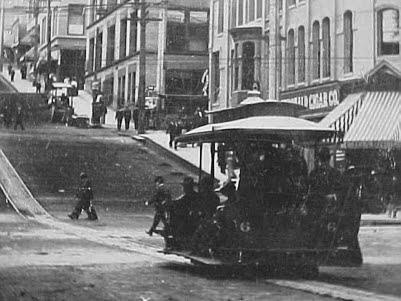 A Powell Street car crosses in the background. April, 2000 Picture of the Month. A West Chicago train on Madison Street. March, 2000 Picture of the Month. 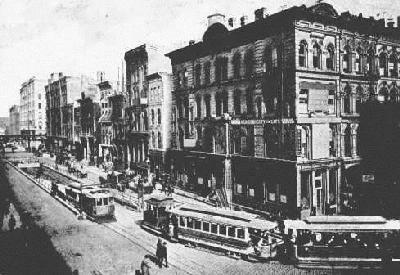 North Chicago cable trains at the south portal of the LaSalle Street tunnel. 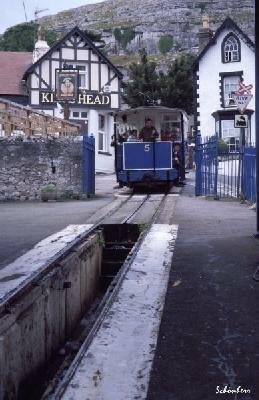 Note the short grip car on the train entering the tunnel. February, 2000 Picture of the Month. A Chicago City Railway train on State north of Adams Street. The third car in the train is an electric car being hauled into the Loop area. January, 2000 Picture of the Month. 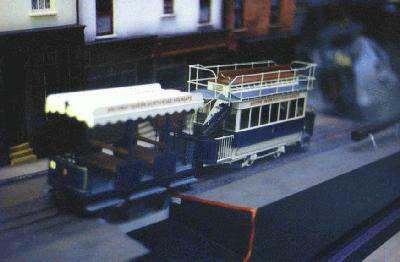 A model of a Highgate Hill train at the London Transport Museum, Covent Garden, London. 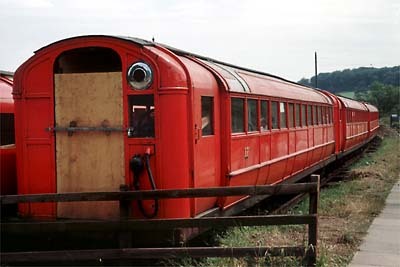 Note the double decked trailer. Photo by Stuart Jenkins. December, 1999 Picture of the Month. At the foot of the Mount Washington funicular. The ticket office and waiting room on the left still stands. November, 1999 Picture of the Month. 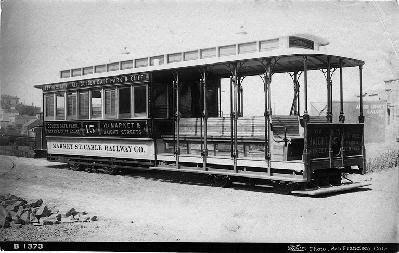 A Powell Street Railway car at the Bay and Taylor terminal of the Powell/Mason line about 1890. There are no windows in the front of the car. Note the front-facing seat occupied by the lady and the child. The Bombay roof's "eyelid" is in front of the bell on the roof. October, 1999 Picture of the Month. 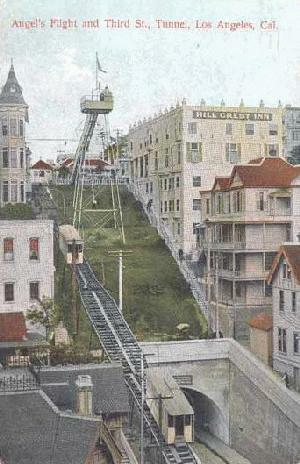 A high level view of Angel's Flight, clearly showing the passing track. September, 1999 Picture of the Month. 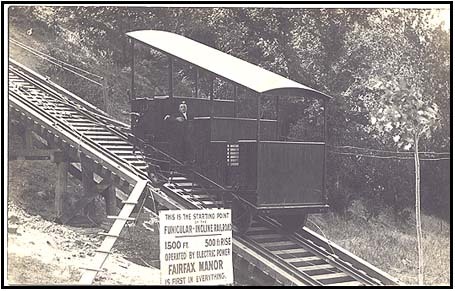 A Mount Lowe funicular car, during Pacific Electric operation. Note the tiers, which kept the seats level. August, 1999 Picture of the Month. 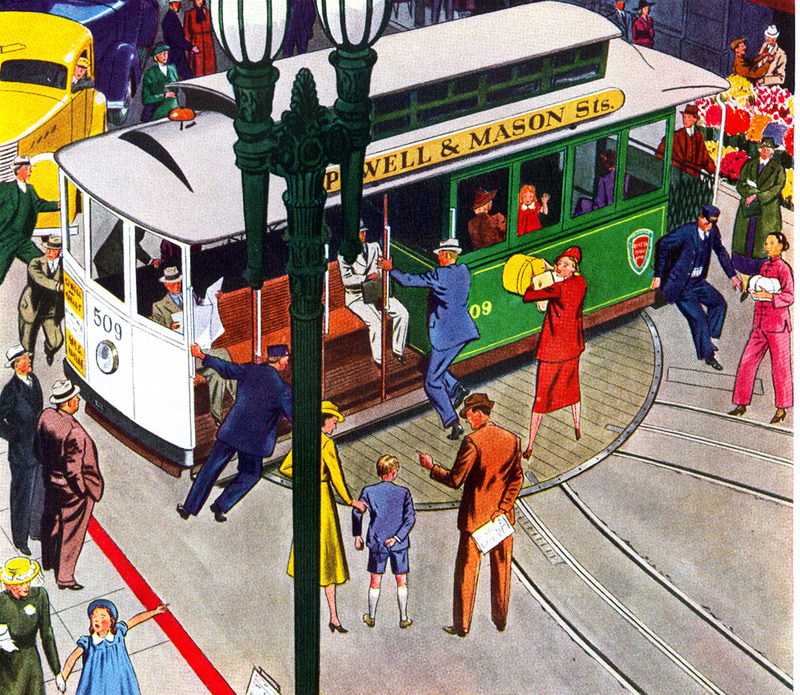 Henry Casebolt stands at the controls of his overhead cable car. Photograph courtesy of the Museum of the City of San Francisco. July, 1999 Picture of the Month. 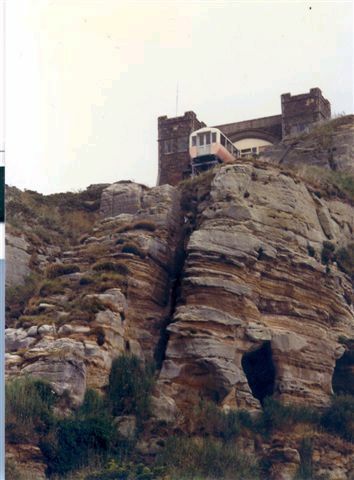 Former San Diego Cable Railway car converted to electricity. This picture was taken between 1896 and 1898. Photograph used with the kind permission of the San Diego Historical Society. June, 1999 Picture of the Month. 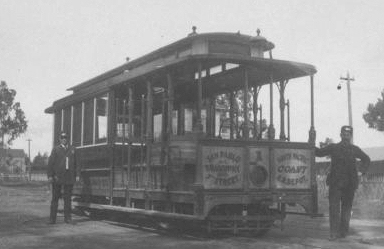 Oakland Cable Railway Car One at San Pablo and Park Avenues in Emeryville, the outer terminal (Source: [group 3:29], Frank B. Rodolph Photograph Collection, BANC PIC 1905.17146-17161--PIC, The Bancroft Library, University of California, Berkeley). April, 1999 Picture of the Month. 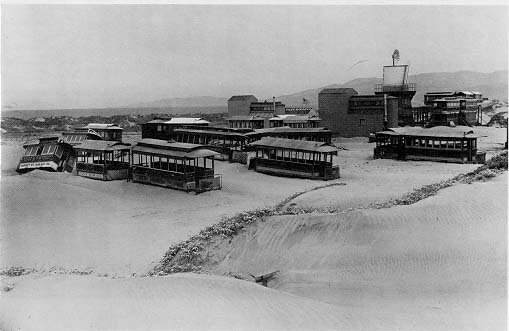 The Los Angeles Cable Railway used the "Cape Horn" viaduct to cross the Southern Pacific Railway yards near the Los Angeles River. 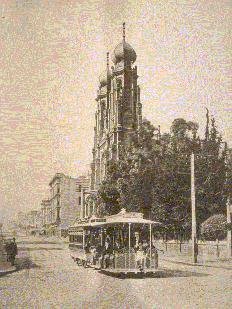 1889 photograph. The viaduct was carried on a single row of columns for over 1 KM (Source: [group 3:21], William C. Barry Collection of Los Angeles Area Photographs, BANC PIC 1964.056--PIC, The Bancroft Library, University of California, Berkeley). Mar, 1999 Picture of the Month. 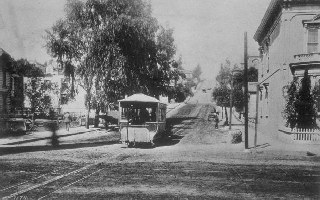 Los Angeles Second Street cable train at Fort (now Broadway) in 1893-1895, photographed by C.C. Pierce (Source: [group 1:12], William C. Barry Collection of Los Angeles Area Photographs, BANC PIC 1964.056--PIC, The Bancroft Library, University of California, Berkeley). Thank you to Don Young for correcting the date. Jan, 1999 Picture of the Month. 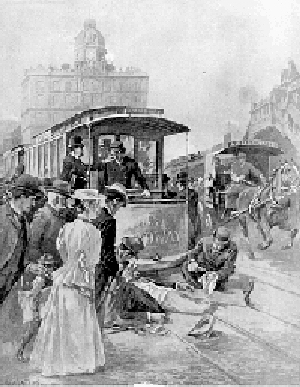 "A Sunday Load" A Market Street Railway cable car on the Hayes or Haight Street line carrying a load of Sunday excursionists to Golden Gate Park (Source: Overland monthly and Out West Magazine (Volume 17, Issue 99 - March, 1891)). Dec 1998 Picture of the Month. 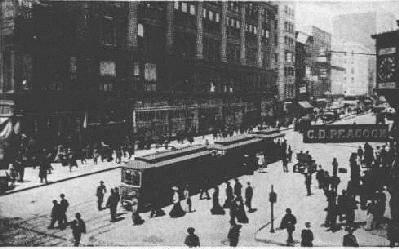 New York Metropolitan Street Railway cable car on Broadway after striking a pedestrian. Note the grip and brakes, which are operated with horizontal wheels. From Leslie's Weekly, 29-Aug-1895 (Source: Still Pictures Branch (NWDNS), National Archives at College Park). Nov, 1998 Picture of the Month. 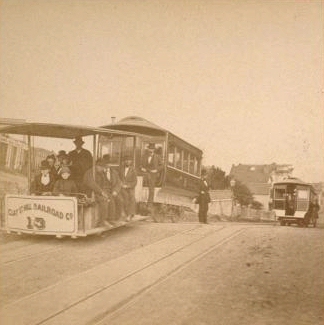 URR California-type cable car, probably on the Valencia Street line, before 1906. 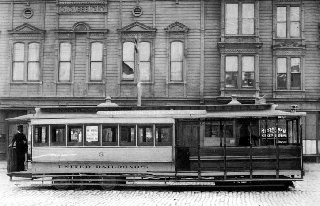 The United Railroads of San Francisco succeeded the Market Street Cable Railway Photograph courtesy of the Museum of the City of San Francisco. Oct, 1998 Picture of the Month. 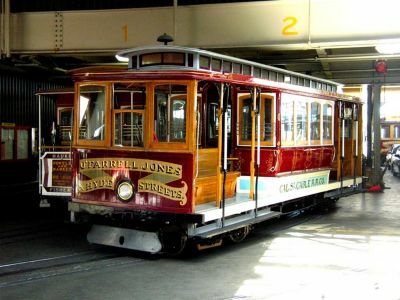 The first Melbourne cable train is preserved at Scienceworks. 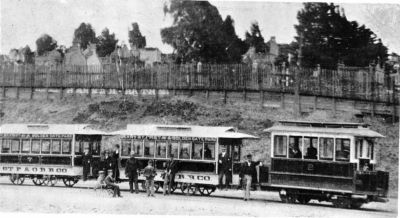 Photograph used with kind permission of Andrew Cox at the Ballarat Vintage Tramway. Jul, 1998 Picture of the Month. 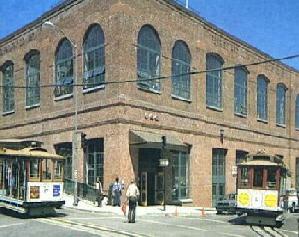 Powell/Hyde and Powell/Mason cars meet by the Washington/Mason powerhouse and car barn. Photograph courtesy of the Artcom Museum Tour. Jun, 1998 Picture of the Month. 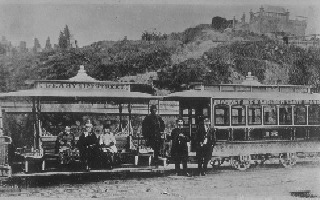 Geary Street Park & Ocean Railway train at Central (now Presidio) Avenue, before 1892. Calvary Cemetery is in the background. The cemeteries around Central Avenue were a major source of traffic for the line. 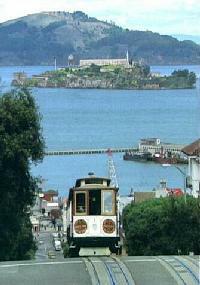 (source: [group 5:50a], Jesse Brown Cook Scrapbooks Documenting San Francisco History and Law Enforcement, ca. 1895-1936, BANC PIC 1996.003--fALB, The Bancroft Library, University of California, Berkeley). Apr, 1998 Picture of the Month. Carville after 1906 (Source: The Barbary MUSH Photo Archive). Feb, 1998 Picture of the Month. Yesler Way grip car preserved at the Smithsonian Institution. Used with permission of the Smithsonian Institution. Jan, 1998 Picture of the Month. Powell/Hyde car One climbing the Hyde Street Hill in San Francisco. Photograph courtesy of the Artcom Museum Tour. Dec, 1997 Picture of the Month. 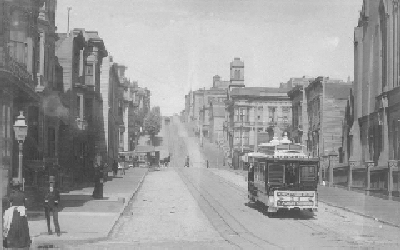 California Street Cable Railroad train, inbound, probably between Franklin and Gough, before 1891 (Source: "Market Street Railway Company, Past, Present and Future", San Francisco News Letter, Sep 1925). Nov, 1997 Picture of the Month. 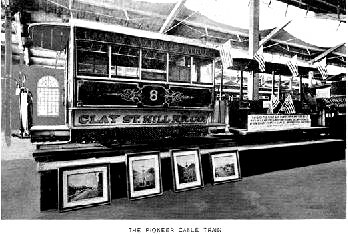 Market Street Cable Railway open car before 1906 (Source: "Market Street Railway Company, Past, Present and Future", San Francisco News Letter, Sep 1925). Oct, 1997 Picture of the Month. 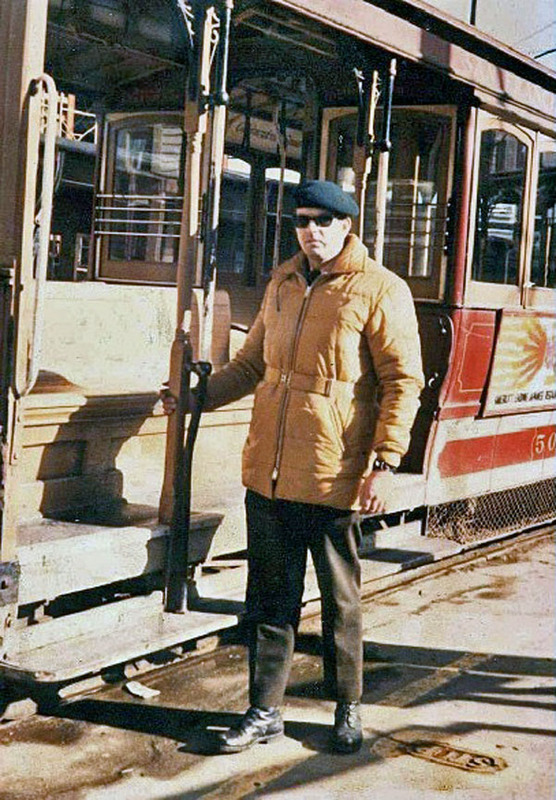 President JW Harris of the California Street Cable Railroad standing in front of a car, perhaps at Presidio Avenue, with the refined and original versions of the Root single jaw side grip used by the line. 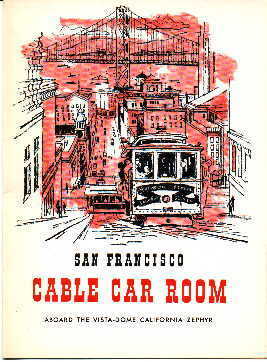 Mr Harris started with the company as a manual laborer in 1879 (Source: "Cable Car Days in San Francisco", Edgar M. Kahn, 1944). Aug, 1997 Picture of the Month. 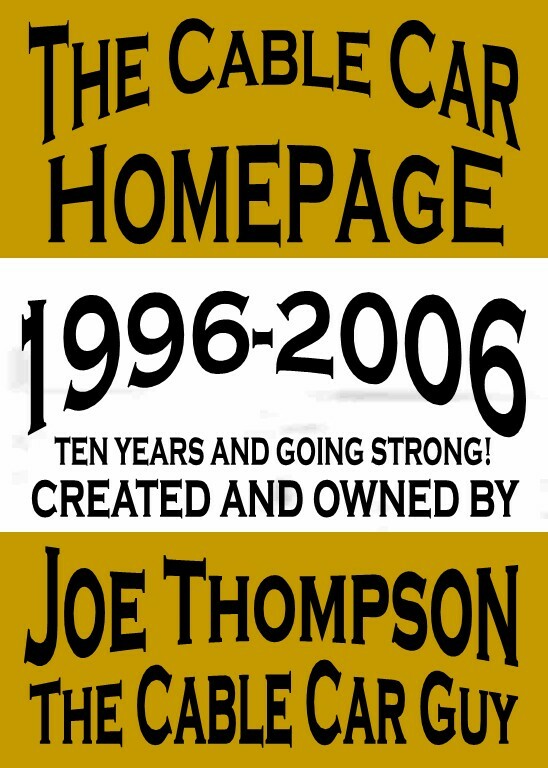 Copyright 1997-2007 by Joe Thompson. All rights reserved.